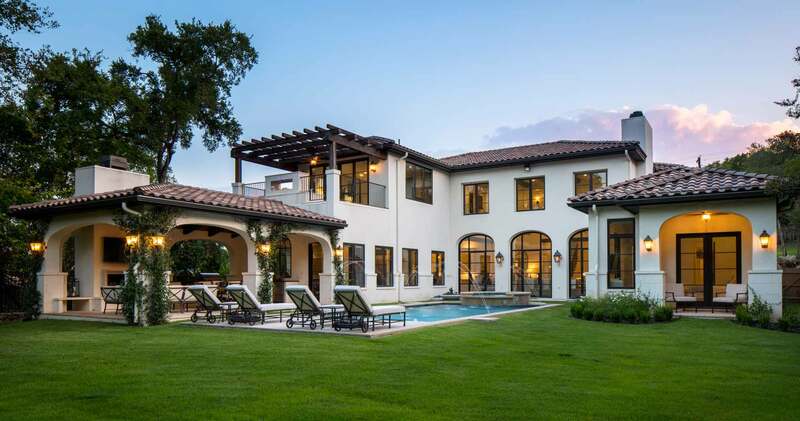 Stately, but inviting, this hacienda right in the midst of a near west Austin enclave has all the earmarks of relaxed luxury from a time gone by. Viewed from the back yard it sprawls gracefully, brimming with entries, and windows and covered conversation spots wrapped around an inviting pool/spa setting. Multiple rooflines topped with classic barrel tile add variety to the pale stucco exterior. 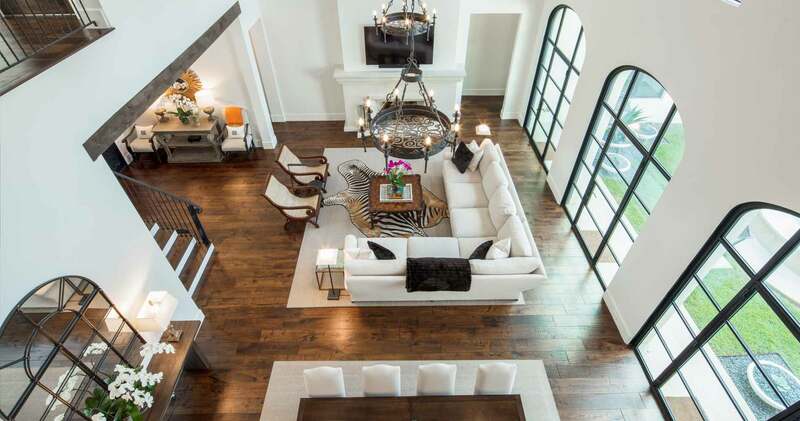 Massive, arched first floor windows present a two-story living area as airy as the outdoors. 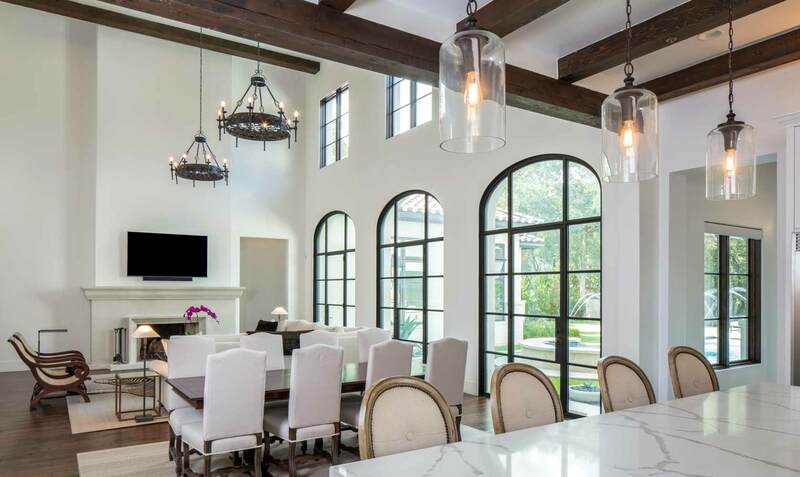 Doors and windows are edged with characteristic dark wood or austere metal casings that contrast with the cool tones that blend the interior and exterior color scheme. Historically, the hacienda was a primary dwelling on a working farm or mine or factory. Here the accent is on leisurely living. There’s a sumptuous feel, an openness, throughout; particularly in the living/dining complex, with its ultra-high cellings and wrought-iron candelabra. Each rooms dimensions are defined by furnishing and function rather than walls and doors. It’s a remarkable modernization of the traditional Spanish style, with sight lines that span the entire main living area from fireplace to kitchen. And that kitchen! It sparkles with the bright, cheery cabinet tones that are popular today. WIth it’s light-toned granite and stainless appliances this room is decidedly less hacienda and more haute cuisine. 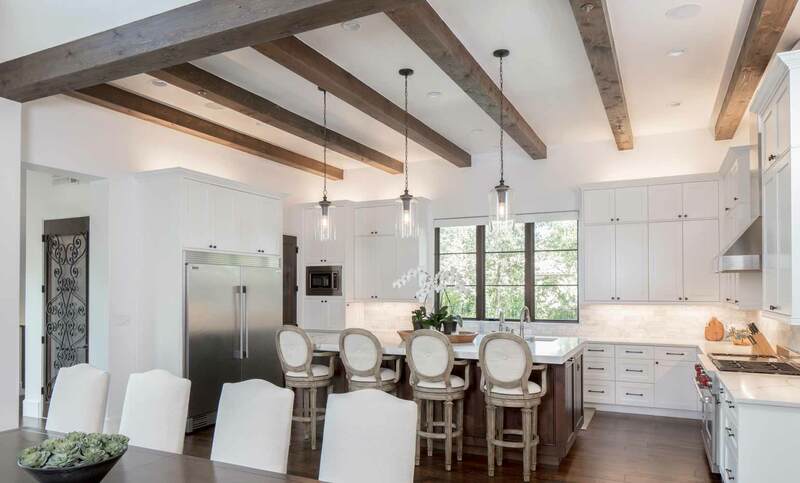 Rough-hewn headers – and in the kitchen, matching beams – mirror the warmth of wood plank floors and add to the rustic feel of the place. 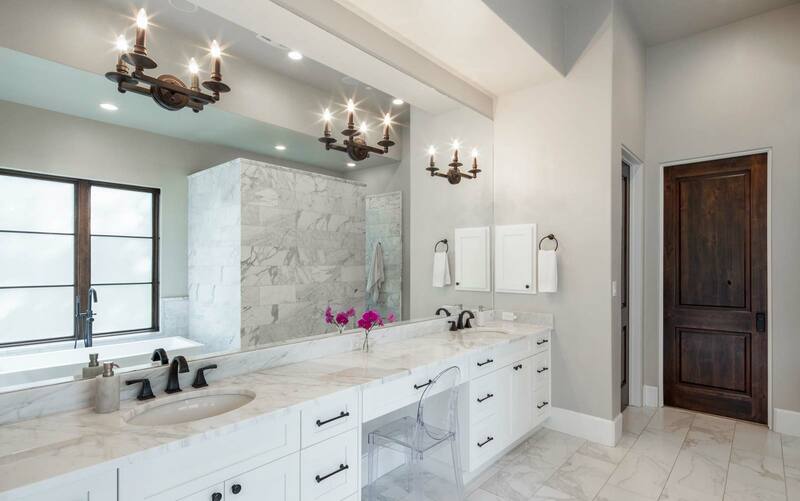 The lighting is a carefully balanced amalgam of ultra-modern and ornate antique that in less-skilled hands might seem to clash. Marbled tiles in the living areas look as if they’d actually be cool to the touch. 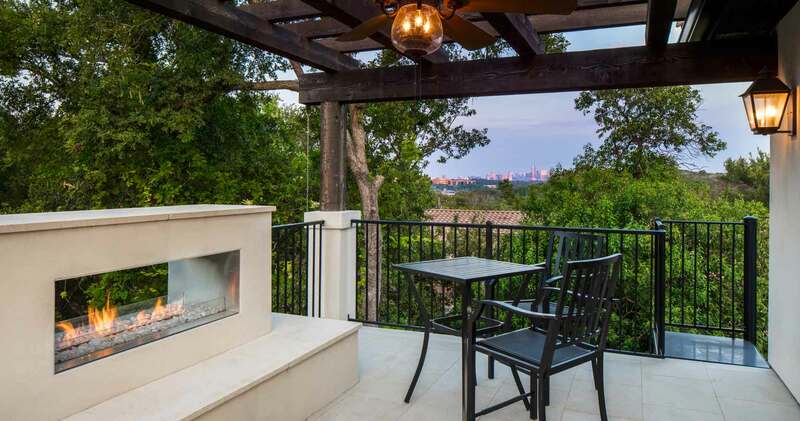 And at days-end, what better way to celebrate than to retreat to an open-air portico with a see-through firepit and watch the sun set on the city.